Some people are tempted to “collect” as many cards as they possibly can. There is a false perception of wealth when you notice somebody with a wallet full of credit cards. In many cases less is more. You need to calculate how much you really are able to afford. Remember that you need to consider your spending as well as interest and any additional bank fees. So, before you apply for any additional cards, be honest with yourself about how much you can afford. At the end of every payment cycle, you will be provided with a detailed statement. This statement will include the total amount outstanding as well as the amount payable. Take note of the due date for payment and, whatever you do, never miss a payment! If you do, this could lead to substantial penalties. Cardholders are encouraged to pay off the full amount outstanding on their cards each month. This is yet another reason you should not spend beyond your means. Only spend an amount that you can afford to pay in full once you receive your salary. Signing on the dotted line without taking the time to read all of the terms and conditions is a significant problem. We have gotten into a habit of believing that terms are not negotiable, and we, therefore, don’t even “waste time” trying to understand them all. The truth is that you are signing that document which means that you are declaring that you have read them, and you also understand and agree to the terms. Within the fine print, you could find terms that do not suit your needs which is why it’s so vital to take your time and read it thoroughly. Ask the representative to explain anything that you do not understand and don’t be afraid to ask questions or even walk away if the terms aren’t to your liking. Your statement will indicate the amount payable along with a due date. This amount is the minimum amount due, but it does not mean that you cannot pay more. In fact, it’s advisable to pay as much as you can afford. The more you pay, the lower your balance will be which will mean less interest accumulated. When applying for a credit card, take some time to compare different rates. Banks offer a variety of credit cards to suit different personal and corporate needs. Make sure that the benefits you are due to receive (such as travel miles or cash back) are really worthwhile based on your lifestyle choices. If you have several cards, and you’re not really using one or more of them, you should think twice before closing them. This is because it can have a negative impact on your credit score. How? Well, your credit score is calculated by adding up the total amount of credit that you have available versus the amount of debt accumulated. Therefore, if you close an unused card, you will decrease the amount of credit available but it will not affect the amount of debt. This will give the impression that your finances are being poorly managed. Instead, try paying off one or more of your cards before closing one. Always make sure that you close cards with the lowest credit available first. This will help you build and maintain a higher credit score while you pay off your debt. Don’t spend uncontrollably on one or more of your cards. If you try to pay for something with a maxed out card, it will result in embarrassment, inconvenience, and frustration. Even more so, the more you spend, the higher your minimum payment will be, and the more interest will be accumulated since it is calculated as a percentage of the amount spent. Obtaining a cash advance can lead to several complications. One of which being a higher interest rate on that amount. Secondly, you might be obligated by the terms and conditions to pay off your regular credit card debt before they will allow you to pay off the cash advance amount. When you visit a store with cash in hand, you cannot spend more than you have. This limits you to buy only what you need and nothing more. In some cases, you might splurge and buy one luxury item but it will not break the bank. However, when you have a credit card or two, you might be tempted to buy things you do not really need. Before purchasing on credit, make sure that you actually need the item and don’t simply want it. Many people with multiple credit cards find themselves in trouble from time to time. They then try to juggle all of their payments. They do this by paying one credit card and then using that card to pay into another card or account due for payment. So, instead of paying off their card, they are maintaining a negative balance and the interest will continue to accumulate. In order to make sound financial decisions with regards to credit cards, it’s important to compare all of the options available. 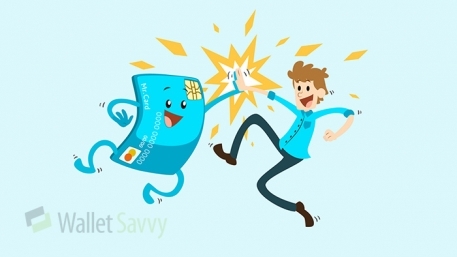 Our free tool at Wallet Savvy will help you determine which credit cards will suit your needs as well as your budget.